This programme aims to equip you with tools that will empower you to take control of your finances and build for the future. Please keep in mind that this is a third party course and by selecting any of the course buttons contained in the lessons you will be redirected to the course page. If you wish to return to UKZN Extended Learning we suggest leaving the page open, you may also choose to reopen it. We recommend doing them in order from Basic, to Intermediate, to Advanced. Anyone who would like to develop an understanding of managing their personal finances. Topics covered range from budgeting to retirement planning. 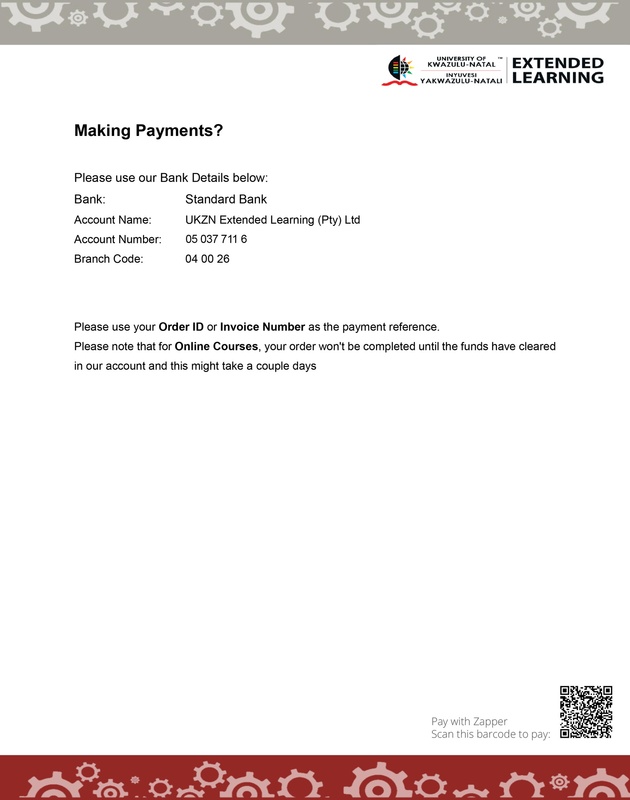 Module 1: Basics – Financial health, financial perspective, credit, budgeting, savings. Module 2: Intermediate (Personal Financial Planning) – Buying a car, getting married, buying a house, children’s education, retirement. Module 3: Advanced (Beyond Planning For Big Life Events) – Life insurance, short term insurance, share trading, debt rehabilitation, trusts and wills.